41. A new commandment: "Love"
A couple and their two lovely daughters ran a small but successful family business in a little provincial village Everyone lent a hand: the father, the mother, the two daughters and the saleswomen they had engaged to deal with an ever increasing clientele. One night, for no apparent reason, the youngest of the two girls left the home without saying a word leaving just a few lines on the corner of the big family table. That night she packed her little suitcase, took all her savings, and climbed into the first car bound for 'the big city'. At first she enjoyed the life. The friends, the night clubs , the restaurants, the movies, the wild nights but in six months her savings had melted like snow in the sun. Her friends began to drop her and even the boys, who had at first liked her free spirit, began to find her annoying with her endless problems and her need for money. Soon she was on the street. She became a vagrant sometimes hitch-hiking and often sleeping under the stars. She was frightened of the men who wanted to take advantage of her and even try to exploit her. She had not eaten for two days. She was cold and thought she might be pregnant. She had walked for a long time and stopped in front of a house which resembled that of her parents. She approached cautiously and between the curtains saw two little girls eating some good hot soup with their parents while the youngest laughed at the puppy rolling happily at her feet. She recalls how comfortable she had been at home and the thought of that lost happiness makes her weep with remorse and sadness. She remembered the recurring dream which haunted her nights. "Suppose I return home? I would beg my parents' forgiveness and, even if they did not want me in the shop, I would do all the chores which I used to refuse to do. If need be I would work for nothing if only they would allow me to go back to them." Her parents, who had had no news of her since she left, were extremely worried. They spent sleepless nights listening for a car stopping, for a footstep in the street, for the bark of a dog. "Tell me, do you think our little girl is all right?" One morning the father was standing on the doorstep when, suddenly, he saw her at the end of the street. She was a pitiful sight with her dirty sweater, her tattered jeans, her long hair hanging in her eyes and her haggard face, but the father ran towards her followed by the dog who recognised her and was barking and jumping for joy. "Father, I am no longer worthy to be your daughter, but if only you would accept me as one of your workers?" The father did not allow her to finish. He brought her into the living room and sent an employee to buy some new clothes and the best shoes available. The shop and the workroom were closed, the foie gras which had been put aside for Christmas was brought out and the Champaign was opened. "My child, do not be angry, here you always had your place, but we rejoiced because your sister was lost and now she is found; we thought her dead and she is alive". This modern version of the story of the prodigal son (Luke 15, v.11-32) is always topical. How many children have left and never been found again? And how many may have had the chance and the courage to return home. In this parable Jesus puts the emphasis on the immense bounty the Father who gives to all his children who have the courage to return to him; a fatherly and forgiving welcome. What is a KINGDOM ? It is first a region, a country or a world. Then it is a jurisdiction administered by a king who commands respect for his authority and his justice. The Kingdom of Heaven, as Jesus calls it, is a world or a universe ruled by God the Father and administered by the angels. Jesus promises that, if we are considered worthy of admission to this spiritual universe, we may becomes God's children, obtain eternal life, draw near to God and one day accede to complete knowledge. Saint Paul wrote: 'One day, after our death, we will meet him "FACE TO FACE". Matthew 22 (God) who wished to celebrate the wedding of his son (Jesus) and sent out invitations to dignitaries and Pharisees but they refused to come and killed the royal messengers (certain prophets like Zechariah and the Baptist). The king ordered that these murderers be replaced at the banquet by the poorest people in the Kingdom, (the pagans) on condition they wear clothes prepared for the occasion, (that is to say they change their lifestyle and prepare their hearts for the celebration). Matthew 13 v 24 A field in which a man had sown good seed but where his enemy, during the night, came and sowed weeds among the grains of good wheat. When the man saw the two seeds grow up together he told his servants not to pull up the weeds for fear of uprooting the sprouting wheat. He told them to let the two grow up together until the harvest when they would sort the good grain from the bad weeds. A mustard seed, the smallest seed there is; yet will become a big shrub where birds will build their nests. A treasure buried in a field. He who finds it will sell all his belongings in order to buy the field. A fig tree (man) which bears no fruit, and to which God has given nourishment in the hope it will bear fruit before it is cut down (allowed to die). WHO will be greatest in the Kingdom of Heaven? Jesus, calling to him a little child said "
"Whoever makes himself lowly, becoming like this little child is of greatest importance in heaven". An angel prevents Abraham from sacrificing his son Isaac (Genesis 22). Three angels visit Abraham and Sarah in the guise of strangers. Two angels visit Lot in Sodom to pronounce the condemnation of Sodom and Gomorrah. MOSES and ELIJAH were comforted by angels during their tribulations. Mark 16, v.5. After the resurrection of Christ the women saw a young man dressed in white. John , v.12 Mary Magdalene came to the tomb and saw two angels dressed in white. These are cases of spiritual beings come from heaven who appear human but are not subject to the laws of gravity. Paul in his letter to the Hebrews warns, however, that angels can take on the appearance of anonymous human beings and therefore pass unnoticed. (Hebrews 13, v2) 'some have entertained angels without knowing it'. Matthew 4, v.4: The devil tempted Jesus on a high mountain. John 8, v.44. Jesus speaking to the Pharisees after their first attempt to stone him, said: "The father you spring from is the devil, and willingly you carry out his wishes. He brought death to man from the beginning and has never based himself on truth; the truth is not in him. Lying speech is his native tongue; he is a liar and the father of lies". Matthew 9, v.16 they brought him many who were possessed and he expelled the spirits by a simple command. Matthew 9, v.32 they brought him a mute who was possessed by a demon. Jesus expelled the spirit and the mute began to speak. Matthew 13, v.39. Jesus explains to his disciples the parable of the weeds in the field, saying:"the enemy who sowed the weeds is the devil!". Luke 8, v.2. 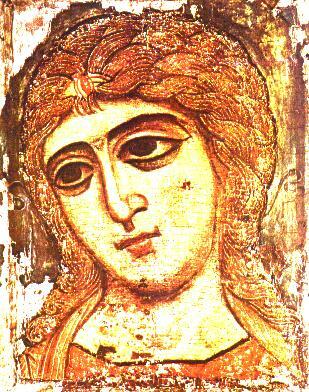 Mary Magdalene from whom seven devils had gone out. "Why torture us, Jesus - son of the Most High?" "What if your name? ", asked Jesus. "My name is legion", answered the demons. Jesus ordered them to leave the man but, not knowing where to go, they asked permission to enter a herd of swine that was grazing nearby. Jesus gave them permission and the crowd, astounded, watched while the swine became agitated and rushed down the bluff into the lake while their keepers fled. Many inhabitants of the region came to see the miracle and were surprised to see the man from whom the devils had departed sitting clothed and in his right mind at Jesus' feet. These people were so shocked by what they saw that they asked Jesus to leave the area as quickly as possible. The whole world is under the power of the EVIL ONE. the EVIL ONE will not touch him. "I give you a new commandment, such as my love has been for you so must your love be for each other. This is how all will know you are my disciples". John 14, v.21 "He who obeys the commandments he has from me is the man who loves me; and he who loves me will be loved by my Father. I too will love him and reveal myself to him." John 15, v.13 "There is no greater love than this; to lay down one's life for one's friends. You are my friends if you do what I command you" These words remained in the hearts of the disciples long after the Master left them. James 1, Ch.2, v.8 "You are acting rightly, however, if you fulfill the law of the kingdom, you shall love your neighbor as yourself". John 1, Ch.4, v.7 "Beloved, let us love one another because love is of God. The man without love has known nothing of God, for GOD IS LOVE". Love then consists in this not that we have loved God but that He has loved us (first) and has sent his son as an offering for our sins. "Beloved, if God has loved us so, we must have the same love for one another. If we love one another God dwells in us, and his love is brought to perfection in us". We (the apostles) have come to know and to believe in the love God has for us. God is love and he who abides; in love abides in God and God in him". John, Ch.4. v.18 "Love has no room for fear; rather perfect love casts out all fear, and since fear has to do with punishment, love is not yet perfect in one who is afraid". John, Ch 4, v. 20 'If anyone says, "My love is fixed on God "yet hates his brother he is a liar. The commandment we have from him is this:"whoever loves God must also love his brother.". 1 John, Ch.3, v.17 "How can God's love survive in a man who has enough of this world's goods yet closes his heart to his brother when he sees him in need?" "Little children let us love in deed and in truth and not merely talk about it," and make (unkept) promises. James Ch2, v. 20 "Do you want proof, you ignoramus, that without works faith is idle". Letter of Paul to the Romans, Ch.13, v.10 "Love never wrongs the neighbor, hence love is the fulfillment of the law." Epistle of Jude (cousin of Christ) v.20. "But you, beloved, grow strong in your holy faith through prayer in the Holy Spirit". 1 Peter, Ch.1. V.24 "All mankind is grass and the glory of men is like the flower of the field. Th grass withers, the flowers wilt, but the word of the Lord endures forever." Proverbs Ch.17, v.17. 'He who is a friend is always a friend, and a brother is born in the time of stress'. You could be a friend. To make amends. For your sins and for The help that once was given to you? They all gaze at the ground, Listen to your conscience. And never into each others' eyes. It has no arms and legs. Try and be sincere and It offers you renewal. Do not be like them. The chosen are assembling. To be available whenever possible. To give whatever one can without expecting any return. To tell the truth when it is essential. To know the value of tears and to calm a soul in distress. Help the neighbors who are out of work. At any time of the day To forget to curse. To watch the skies Smell in our country-sides. And to fight side by side. They bring happiness And go to sleep at night. And adore tenderness All the love there is. Which come from afar To mark one's existence. Gathered by children. And surround the dying. Flowers. When life is too hard And breath all their perfune. And put some flowers it. There is no general consensus on the exact place where Jesus is said to have given his famous sermon containing the Beatitudes. Matthew mentions it vaguely in Chapters 5 and 7 as having been given on a mountain in Galilee, not far from Capernaum. Some claim it was on a plateau known as the Horns of Hattin, where the Cruisaders were soundly defeated by the army of Saladin; some the green hills of Tabgha between Capernaum and Magdala near lake Gennesaret, others again place it on Mount Tabor, the highest hill in Northern Galilee. 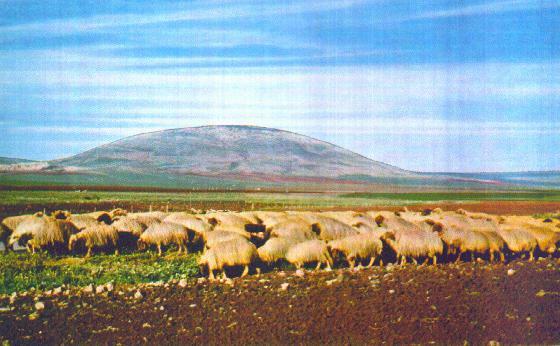 "Mount TABOR is surrounded by small hills and stands like a shepherd among his sheep. It is 588 m. above sea-level, but one must remember that the inside slope goes down to Lake Gennesaret which is situated -8 m below the level of the Mediterranean." The exact location was not uppermost in the minds of Matthew or Luke; that which was important was the message given to the world from that spot. Jesus knew Mount Tabor perfectly as it is near the village of Nazareth where he grew up. Now he liked to go there alone or with his disciples to meditate and contemplate from above the wonderful panorama of the Lower Galilee and the view over the great lake. The landscape is filled with of great fields of wheat which undulate like a long blond hair in the evening breeze which blows from the sea. In contrast to the brown earth and a sky almost always blue are green patches covering whole hillsides. These are the many vineyards where grow great bunches of grapes bursting with sunshine which give a thick and heavy wine that goes to the head if it is not diluted with water. Lake Meiron, through which flows the Jordan, is visible as a little blue stain on the landscape. In those days there still stood some forests of magnificent cedars of Lebanon. On the horizon lies a high chain of mountains topped by the famous Mount Hermon which rises to 2.760 m. It is here that Philip, the half brother of Herod Antipas found the source of the Jordan. The first village to come in sight is Naim, then Jaffa in Galilee the town with the double ramparts and which would take an active part in the revolt against the Romans in the year 66. A little further down commence the Mountains of Samaria, a region where the Jews do not like to linger and which they avoid crossing as much as possible. One can admire the great jade green lake Gennesaret which resembles an enormous emerald lying on a bed of amber and copper colored quartz formed by the mountains of Syria. In the morning when the sun rise from the lake it lights the entire horizon in a reddish glow before changing into an enormous ball of golden fire mounting to its zenith in a sky nearly always blue. There were several thousand men and women who had come from afar because they had heard of this exceptional man. There are children, and sick people who are hoping to be cured. There are the curious, the zealots who wonder if this Jesus is really the long awaited Messiah, and of course a large delegation of Pharisees who were hoping to find this imposter defying tradition and the Law of Moses. Jesus wants to be heard by everyone, he knows the importance of the message he about to give the world and which will go down through the ages. No-one had ever openly declared before so many people the vanity of the world and the reversal of all the values considered up till now to be the way to happiness: success in society, the triumph of the strongest, the cleverest, the richest and the most determined to do away with their neighbors and especially the weak. The poor, the sick, the oppressed of society could not believe their ears! The disciples approved the courage of their Master while the Pharisees, rubbing their hands, smiled and sniggered amongst themselves. It is not with such a discourse, they murmur, that he will become Head Priest and the King of the Jews!